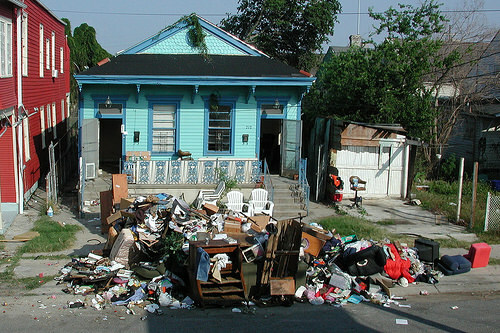 Ok, my house didn’t quite look like this, but I did have a LOT of stuff. I vividly remember sitting in the empty shell of my house after the removal men had taken away all but my last possessions. The only items that remained were my bed, which would be collected the next day, and a spare-room full of stuff I’d explicitly told the men not to touch on pain of death. 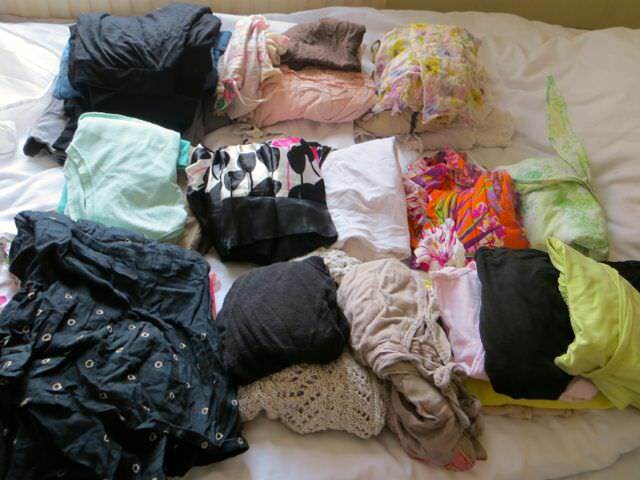 It was September 2010 and that spare-room full of stuff represented the packing shortlist for my year trip around the world. The problem was, I didn’t have the slightest clue how to whittle down the items that filled the room. I looked at my 65 litre backpack and the mound of possessions I didn’t think I could live without and I did the only thing possible in the circumstances…bundled it all into my car (still yet to be sold), made a commitment to deal with it later, and opened a bottle of wine. Fortunately, my brother came to the rescue and a brutal conversation later, I had achieved the seemingly impossible – I had the small bundle of items that made the final cut for what I would be taking around the world. The Big Bag phase: Lighter than a house but light enough? Deciding what to take on that first trip was a difficult process that came in stages – from a house-full of possession, to a room-full, then a car boot-full (trunk for my American readers), and then finally just enough items to fit into my bag, with space only for a postcard…at a push. When I set off, I was carrying a 65 litre backpack and a 17 litre daypack, which contained my valuables. After a short while, I picked up a smaller ‘around town’ bag for my everyday essentials – wallet, phone, camera and water. I thought it would be difficult saying goodbye to all the items I was leaving behind. But once I made the break and settled into life on the road, I got used to living with less. For years this system worked. I popped home a few times and re-stocked but my packing list never got any longer. 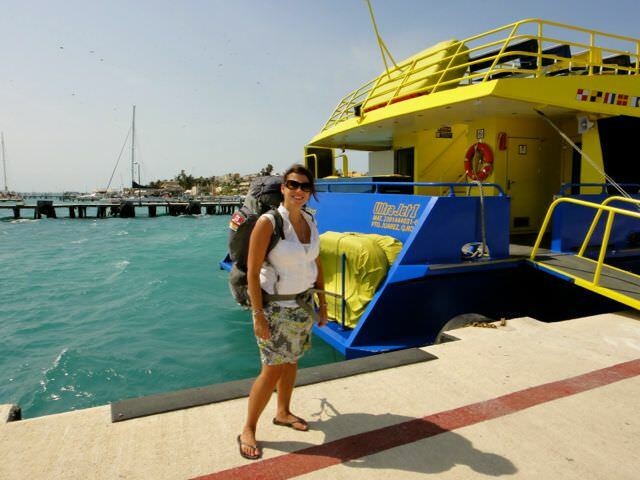 I had learned to live with what I had, sussing out the true travel essentials as I practiced the skill of being a nomad. It wasn’t until I decided on an impromptu trip to Italy this summer, rerouting my ticket from the balmy wet season in Asia, that I looked at my packing situation afresh. 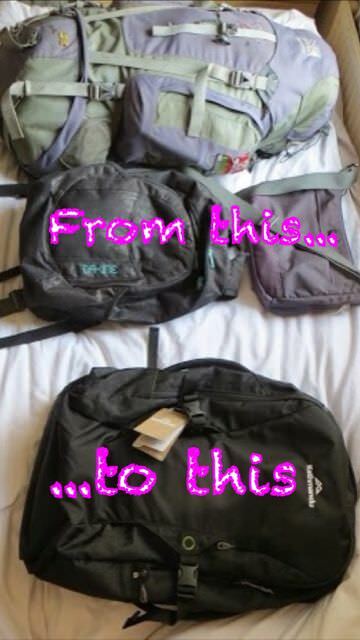 Packing my bag in Bangkok, London-bound, it dawned on me that year by year, I had stopped using many of the items in my bag(s). It was Pareto’s principle in practice (Pareto was a smart Italian guy who determined, for the purpose of my example, that we use 20% of our things 80% of the time). I’d seen it happen in my cubicle life – I used 20% of the items on my desk 80% of the time (phone, computer, pen, swear box). And the same had become true with my backpack. For three years I’d laboured under the notion that I packed light and only carried essential items. Yet, my definition of light and essential had changed considerably since that first attempt at packing up the spare-room full of stuff. I wasn’t carrying the largest bag, but I knew it could be smaller. And the realisation I wasn’t using all of the contents proved that to me. Before my first round the world trip, the concept of packing light didn’t even occur to me – it hadn’t needed to. My trips usually entailed a premium airline (23 kg luggage included, thank you very much) and taxi from the airport to the hotel where I would flop for a week or two. Great, if you’re taking that kind of single location trip. But if you’re itinerary includes more than one stop, involves public transport or comes with budget consciousness, keeping your travel items to a minimum makes better travel sense for so many reasons. Ultimately, you have to carry your bag and often for longer than 5 minutes (especially if you get lost, a frequent occurrence in my life). In short, fewer items equal less weight, equals less physical effort. On a similar note, running for a bus, train, flight…away from an incoming storm…the police (hey, I don’t know your travel style) is going to be easier if you pack light. 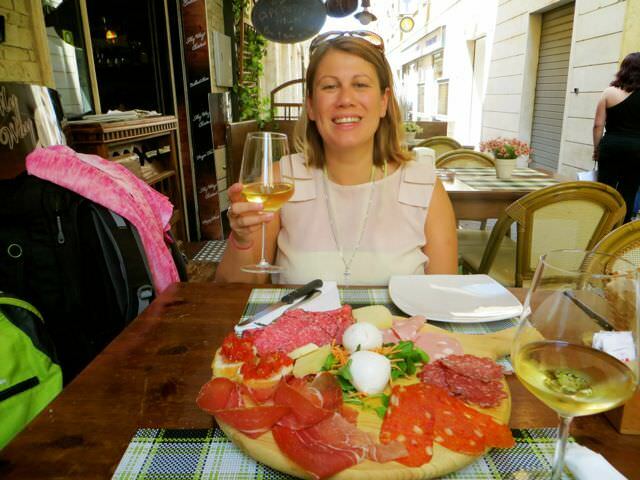 You can visit places ‘on the way’ – en route to Sorrento from Rome this summer I was able to swing by Frascati for lunch. I wouldn’t have been so keen to do that if I was carrying a 65 litre bag. Increased locker security – in hostels or at stations you have more chance of getting your whole bag in a locker if it is smaller. You can carry your bag inside the bus – the only time my bag was ‘burgled’ was when it was stored on top of a bus in Guatemala. Health – after three years, I’m suffering from fallen arches in my feet courtesy of too much bag weight (and forever wearing flip-flops). I’m lucky back problems aren’t on the list too. Packing is a whole lot quicker. 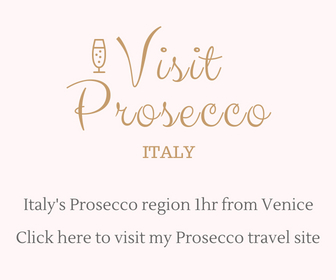 When I booked my flight from London to Italy this summer, I had one goal in mind – finding the cheapest ticket. Sadly, that meant flying with Ryanair, an airline that has some of the strictest cabin baggage requirements and highest checked baggage charges around. Even if you’ve sworn a lifelong promise to your soul never to fly Ryanair (again), the unfortunate reality is that they aren’t the only airline ‘at it’. I knew I would be taking at least two low-cost European flights during my Italy trip (I have to get over the water from the UK somehow) and loathe to pay £25 for the privilege of taking my Big Bag of possessions with me, it was the final prompt I needed. I was going to downsize. Again. I had less than a day in London to choose my bag – a mere few hours really before meeting my brother and my Travel Amiga Karen for fleeting hellos and goodbyes before I once more jetted off to foreign lands. It was quite the challenge given that my Big Bag selection had taken a month of research and involved a purchase, a trial trip to Turkey, a realisation I’d made the wrong choice, another few weeks of shopping and a replacement purchase. I didn’t have the same luxury this time. I needed to get in, buy and get out. The good news was that this time it was easier. 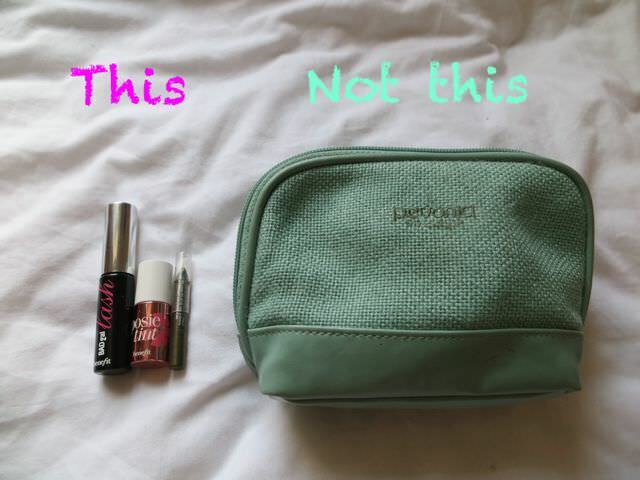 I had some parameters to work to – I had researched Europe’s most stringent carry-on dimensions (thanks for that, Ryanair) and I needed to stick to them. The bag I ended up with was a 38-litre Kathmandu Litehaul Pack v2. Apart from the fact it was black (my Big Bag is a pretty purple and lilac colour that makes me feel girly even during my darkest travel moments), it fit all of my other requirements. Dimensions: As my bag was going to be for carry-on, I researched the European airlines with the strictest carry-on rules and made sure my bag complied with the dimensions. In case you’re interested, Ryanair’s requirements are “strictly one item of cabin baggage per passenger (excluding infants) weighing up to 10kg with maximum dimensions of 55cm x 40cm x 20cm is permitted”. 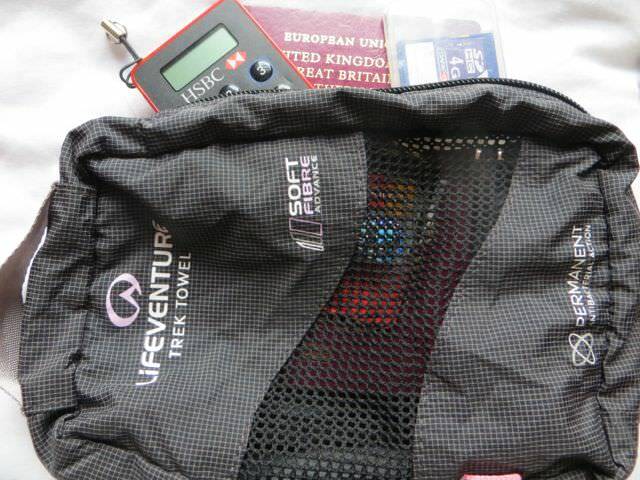 The Litehaul bag is 51cm H x 29cm W x 17cm D. Tick! 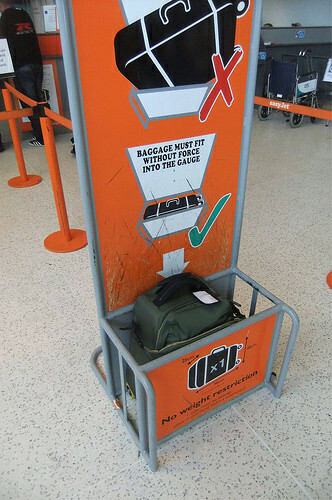 Laptop storage: Some airlines (again, wagging my finger at your, Ryanair), insist on a one bag policy. 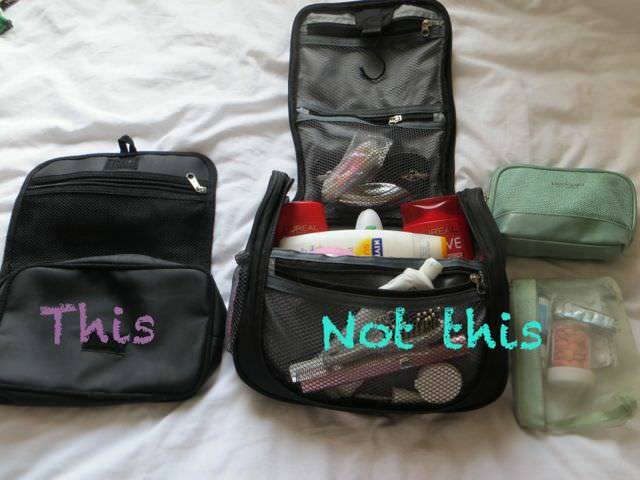 And one bag really does mean one bag – no purse, no daypack, no laptop bags, nothing. So, I wanted a bag that offered both protection for my laptop and, as I try to work on flights (read: watch movies), I wanted easy access when I was on-board. 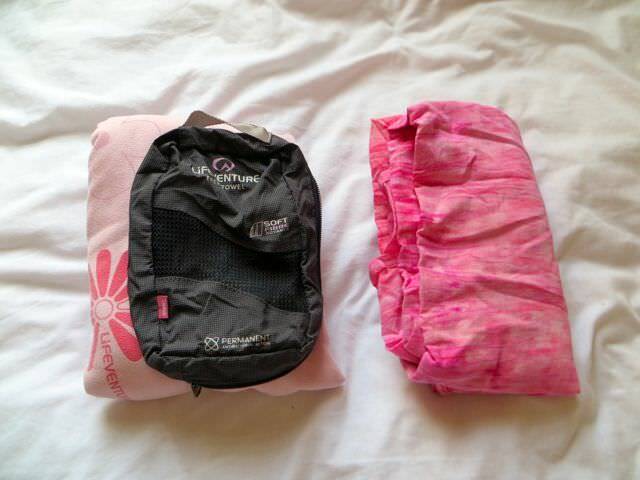 The Kathmandu has a lightly padded compartment that gives me both. Additional easy access storage: remembering that one bag rule, I wanted a bag that had additional pockets for getting to other items I’d need easy access to like my passport and wallet! The Kathmandu has that right at the top as well as a front pocket. the backpack straps can be zipped away – nice if I turn up somewhere a bit more swish. the bag opens up more like a small suitcase making it easier to find things. 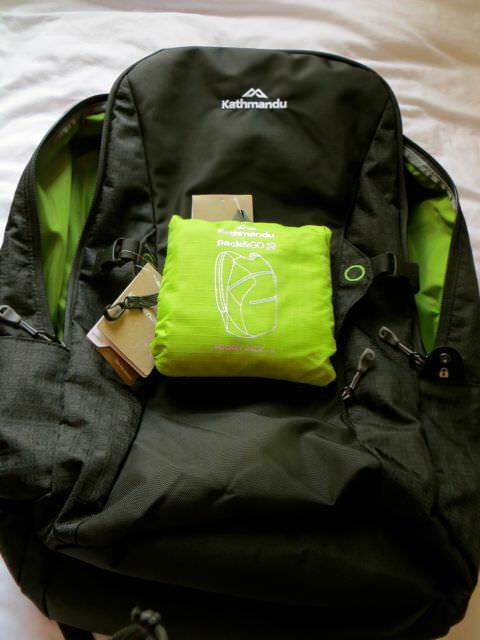 In addition to my carry-on bag, I knew I’d still want a daypack on arrival in Italy, so I complemented my main bag with a fold-up backpack (Pocketpack), also by Kathmandu. The straps were not as padded as the Dakine brand I’m used to and things can get a bit sweaty wearing this for a while in the heat (it isn’t designed to sit away from your body). However, for a fold-up bag, I was very impressed and I will go so far as to say that is has turned out to be one of the best travel items I’ve bought. After completing the packing process many times now, I genuinely believe that the key to packing light is to make a list of the items you NEED. Note: I’ve written that world in capital letters because it is important. 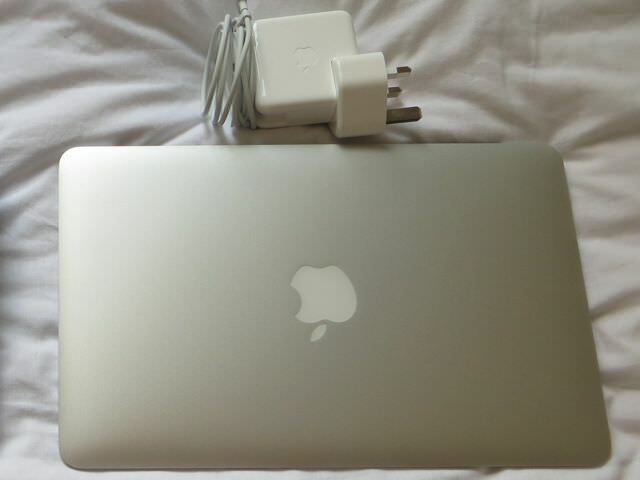 ii) you’re packing from a wish list – adding things you want (emotional attachment) rather than NEED. As I sat on my flight from Bangkok to London, in between movies and gin and tonics, ahem…work, I wrote a short, honest list of what I needed. I didn’t have my belongings in front of me, so I had to work from memory of what was in my bag. 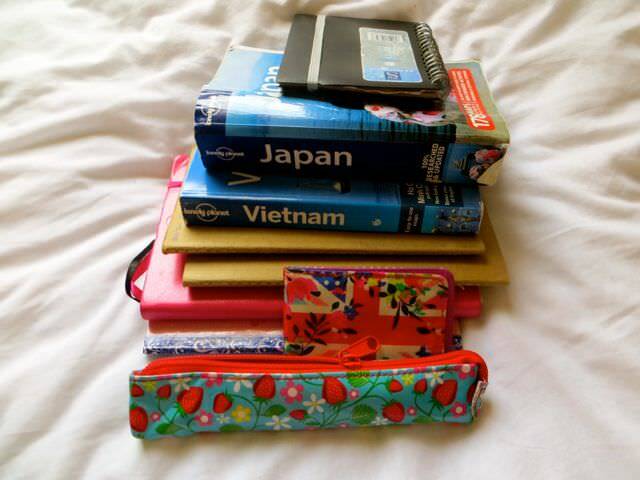 It was a great way of weeding out all of those items I’d forgotten I’d been lugging around (playing cards, Spanish verb cards – in Asia?!) and forced me to think about what I’d genuinely used within the last week. With my list to stick to (this does require a good degree of self-discipline), I set about the re-packing process. What follows is a pictorial illustration of what did and didn’t make the cut for my new bag. What impressed me most (if I do say so myself) is that I managed to reduce the contents and weight of my bag by more than half of what I was packing before. That’s right, more than HALF. My Big Bag and accompanying daypack used to weigh in around 14 kg and 7 kg respectively (my flattening arches suddenly make more sense). At the end of my repacking process I was down to one, 38-litre bag that came in at just under 9 kg. It felt light as a feather as I swung it onto my back and skipped through Shoreditch, Pisa-bound. Barring an extended stay at a nudist colony in warm weather, clothes and underwear are top of everyone’s packing list and the reality was that I was packing too many. The amount shown above, to be exact. Ok, they were good enough for two climates (hot and cold), but there were still only a handful of items I wore over and over. In practice: The list was perfect for a month in Italy. I did wish I had about two more clothing items (one extra top and another pair of shorts) and I spent more time than I wanted rinsing through underwear. Also, this list would require additions for colder weather – I didn’t pack my fleece, rain coat, thicker travel trousers or base layer. But, overall, it cut my day-to-day clothing down by more than half, which was a win. I swear by my travel towel but with every gram of weight up for negotiation, I swapped my trusty Lifeventure towel (left) for a sarong (right). On balance, for a shorter trip where space is an issue, a sarong is a good option. There is something about a well stocked toiletries and medicine bag that bats away my fear of the unknown and I was certainly packing a well stock kit in both respects. My packing list for each had been prepared when I didn’t trust that I was able to pick things up on the road and I’d been carrying pretty much the same volume for years. The good news was, it made for an easy cull. Even better, I had strict 100ml carry-on rules to guide me. 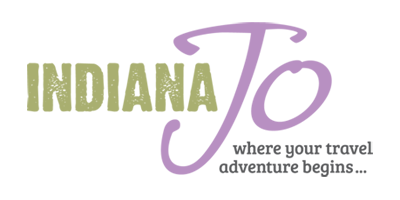 First off, I reduced my shampoo, conditioner, sun cream and body lotion down to travel size and removed all truly non-essential items – perfume and nail varnish. I had also gathered a wonderful collection of tiny make-up items along the way. Amusing given I wear make-up a handful of days per year. But, seeing as I was going to be in the land of the lovely Italian people, who do make such an effort with their appearance, I wanted to look my best. So, I limited myself to three small items. With the help of a great pill-box, I was able to reduce my medical kit down to this one black container that fits in the palm of my hand plus antiseptic cream, something I dab on any bump, scrape or bite that looks like it might cause me trouble down the line. 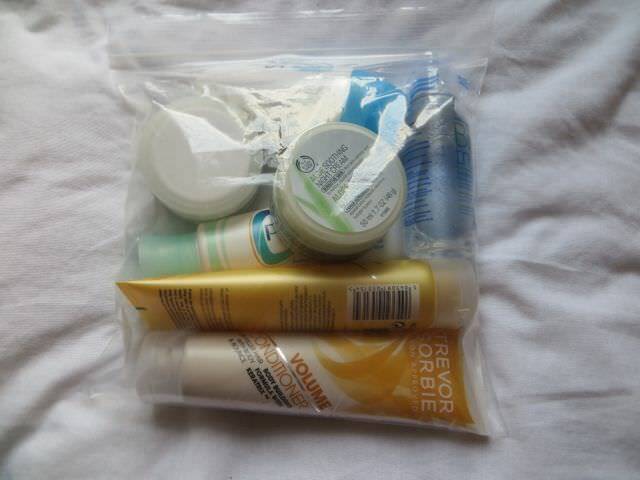 In practice: for a one-month trip, I had the perfect amount of toiletries and just enough medicine to keep any worries at bay (the worry stems from that time I got bed-ridden sick in the jungle in Guatemala for a week). For a longer trip, I wouldn’t carry travel size shampoo or conditioner because it is uneconomical, especially for longer hair that I wash daily. 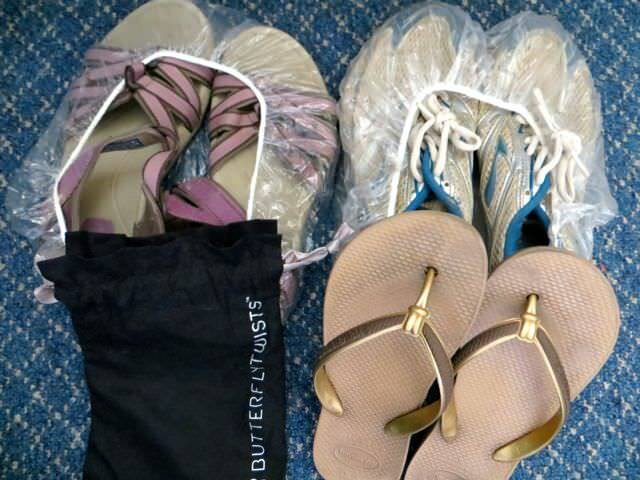 I still think I have the perfect number and shoe-type combination for my travels – four pairs: running shoes, trekking sandals, flip-flops and a pair of fold-up ballet pumps for those cocktail bars I do like to breeze into from time to time. And cunningly carried in shower caps you will see – for space saving and easy access. But, even with my size 3 tiny feet, I needed to sacrifice my running shoes for the sake of space. Also, for the purpose of this short trip and by way of apology to my falling foot arches, I swapped my flat ballet shoes for a pair of heels – hurrah! In practice: did I miss my running shoes? Yes. Especially when I was walking up and (running to catch the bus) down mount Vesuvius. Would I travel with heels again? Perhaps – backpacking in heels was fun! If you don’t take much technology when you travel, then skip to the next section. If you can’t function without it, or need to work on the road (I sit in both camps), then you’ll probably find that kit and cables account for a significant part of your luggage. At the height of my Big Bag days I have to confess I was packing a laptop AND an iPad (work and play), an external hard-drive, camera, phone, kindle, Mi-Fi, plug converter and a charger for each. Sigh. But at least you now understand my 7 kg daypack. 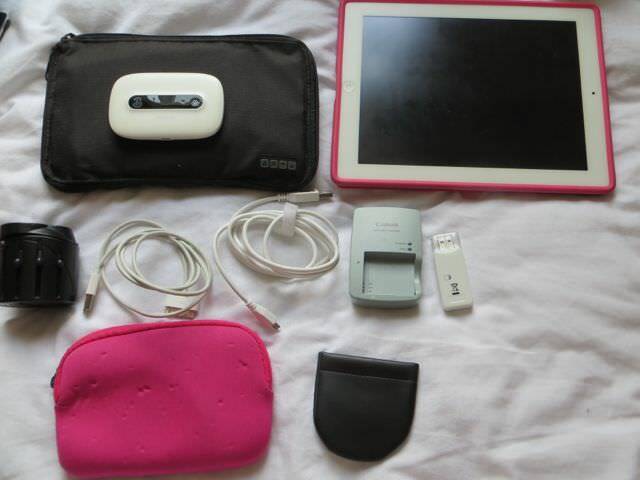 During my downsizing I did the hardest thing – I left my iPad at home. It was something I used daily but it wasn’t necessary, it was purely for fun. The rest of the items were on my ‘necessary’ list, so stayed. Where I did make a fair space-saving was with my travel documents which, again, had been based on a list I wrote before I started travelling. I’d been carrying it around as standard practice for years, but after looking at it critically, I was able to reduce it down quite considerably. Being in Europe without visa applications or a need to prove my yellow fever vaccinations helped. In practice: I did miss my iPad – Candy Crush is so much clearer on there! But, I didn’t miss the extra weight (I have a pretty heavy-duty case on the tablet because I’m clumsy, which practically doubles its weight) and I doubt my iPad would make it on future trips. Well, how do I go about explaining this other than to say I do have a small weakness for books, pens and paper. No matter how my journey starts out (when I left for Japan I had only my lonely planet, diary, notebook and pen), I always end up with a huge stack of this stuff. There was nothing for it other than tough love. 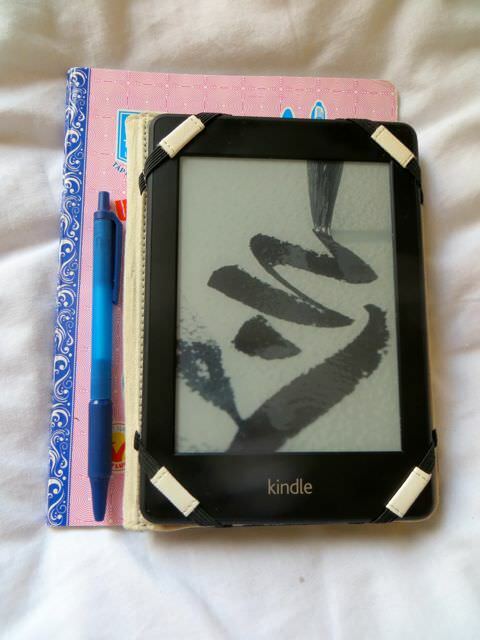 One notepad, one pen and my Kindle, complete with guidebook. That was all I was allowed. In practice: despite anticipating it, the world did not flip off its axis when I packed less than one book. I completely survived. Oh, wait. I kind of did acquire an Italian phrasebook (day three after arrival) and a three pack of small notepads (day 7 after arrival) and maybe another pen or two along the way (days 10 and 15)… Look, this problem is a work in progress. The bottom of my Big Bag had been filled with a host of practical and not-so-practical items that I’d been carting around the world. From a deck of playing cards (you can almost always find someone else who has a set) to my Spanish verb cards (on the off-chance I wanted to practice…in Asia) to my travel chopsticks, I was able to extract a fair number of items based simply on their lack of use. However, I also had to say a temporary goodbye to some otherwise useful items, namely my head torch and penknife. The former, I was comfortable leaving behind. A black-out in Italy was unlikely. 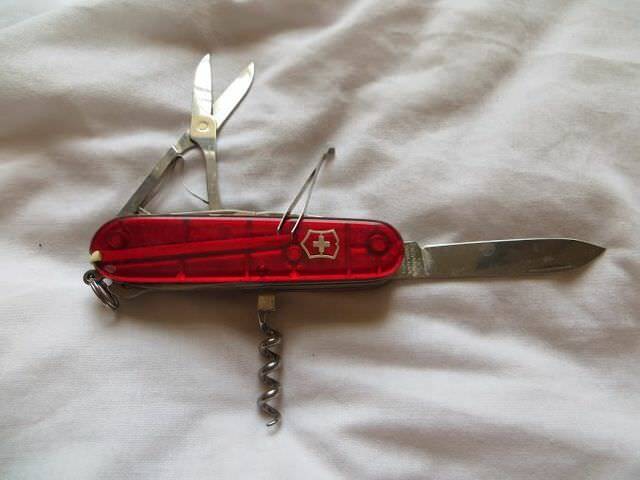 My penknife, on the other hand I was more reluctant to omit (how else was I going to make avocado sandwiches and open wine on buses?). But, having already inadvertently tried to take my knife onto a plane in the US (oops, sorry officer), and failed, I was fairly certain it wouldn’t pass security. What ya gonna do? In practice: I’d definitely want to add my penknife and head torch back into my packing list for a longer trip though the knife precludes carry-on so is something I need to think about a bit more. 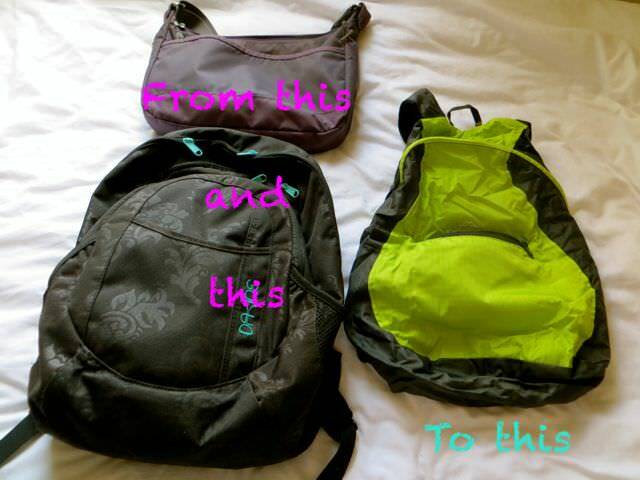 Once I’d completed the whittling down process, especially my books, documents and office kit, getting it all into my new, smaller daypack happened easily. And, there you have it. My process for getting from a big-bag to carry on. I spent my entire travel time in Italy with a large smile on my face, practically skipping at the new lightweight feel of my smaller bag on my back. Plus, I’ll confess to a fair bit of self-pride when other travellers complimented me on how lightly I had packed. Would I take a longer trip with my new, smaller bag? Absolutely…but… I would probably want to take a bigger daypack. 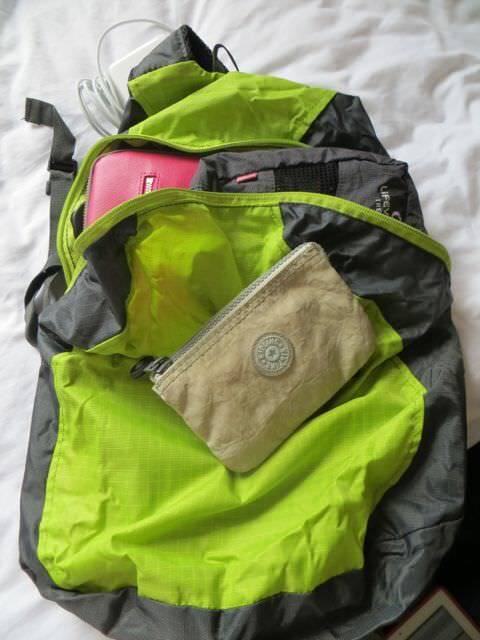 Not only would it allow me to keep my ‘office’ items in one place rather than scattered throughout my main bag, it would free up space to take the items I would miss on a longer trip – rain coat, running shoes, travel towel etc. But, overall, for now, I’m sold. Packing light is the way to go. 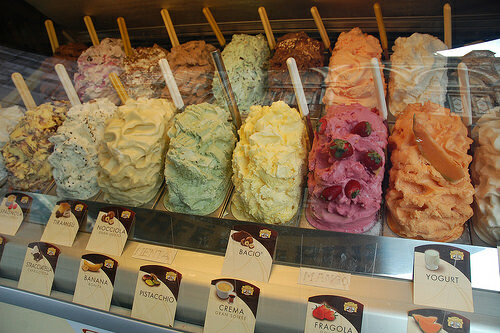 Not least because I got to spend that extra £50 I saved on checked baggage fees on gelato. Now there’s a success if ever I’ve seen one. Coming soon: the ultimate packing list…according to Indiana Jo. 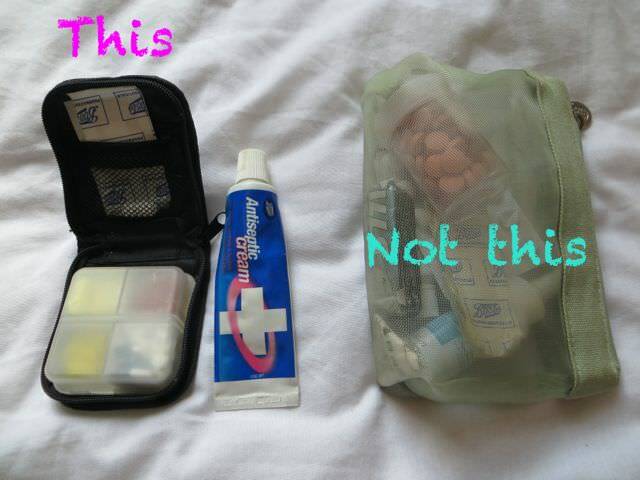 What do you pack for your trips? Any extra packing tips for me? Hooray for you! It’s SO nice not having to labor under all that un-needed stuff! I have my little Gossamer Gear Rukus down to just ten pounds. I am still trying to whittle a little more off. Traveling is FUN now! Another thing I found out was leaving stuff at home is a vacation from said stuff! You just have more time to really see and appreciate all those fabulous new places! I now notice other people struggling and WORKING with their huge heavy bags. I feel so sorry for them. Hey Tam, I presume you mean the Kathmandu lighthaul (not the fold away backpack). Assuming so, I have no reservations with it apart from the fact it was a little too small to take on an extended (8 month) trip that included cold weather. If you’re looking for a bag for a few months or don’t need to pack running shoes and a rain coat, I’d highly recommend it. Although there’s not much by way of hip support, at only 38 litres, it’s not going to get heavy enough to need it. I walked for over an hour with it on and was very happy. Access is also great – they’ve really thought through the one-bag idea with the laptop space and front pocket. There’s not rain cover, which you might want to buy separately but otherwise, so long as you can get everything in, I’d really recommend it. Happy travels. Where are you off to? I read this, it makes absolute sense, yet, I don’t think I could never ever travel with just a carry on. I don’t know how you do it. Thanks, Jac. I used to carry one suitcase just for shoes and “stuff”, so doing this wasn’t easy or fun to start with but once I’d done it, it was actually a relief. It will be interesting to see how I go with a longer trip that includes different climates but, like anything, I guess I will just get used to packing less. And my feet will thank me for it! I’m really impressed Jo! I also love how you laid out ever so clearly how you whittled away your load to something manageable, really informative post. I’m such a lazy packer – I generally like to err on the side of caution on my trips and pack a little bit more, but if I ever do end up traipsing around the world like you, I hope I’ll have the discipline (and bravery) to really just cut out all the crap!